PAHAL provides innovative financing solutions and technical assistance to borrowers and lenders. 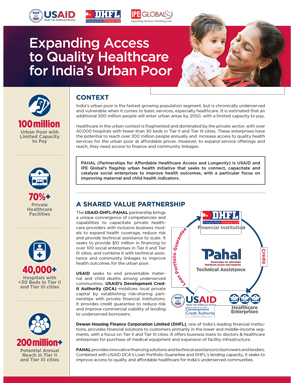 Combined with USAID DCA’s Loan Portfolio Guarantee and DHFL’s lending capacity, it seeks to improve access to quality and affordable healthcare for India’s underserved communities.Healthcare in the urban context is fragmented and dominated by the private sector, with over 40,000 hospitals with fewer than 30 beds in Tier II and Tier III cities. These enterprises have the potential to reach over 200 million people annually and increase access to quality health services for the urban poor at affordable prices. However, to expand service offerings and reach, they need access to finance and community linkages.